As everyone here knows, PlantCatching is a citizen project aimed at all gardeners, and the major challenge of such a project is to make it visible in many areas of the world. As such, I invested myself to spread the word at public events and I offered to freely send flyers to those requesting them. I also sent hundreds of emails and made numerous phone calls. For the rest, I must count on gardeners themselves, those who truly want to see PlantCatching be seeded in their area and consequently get more offer and demand. The Seed you city page gives many ideas to meet this goal. I repeat it loud and clear: your help and commitment are necessary to make things happen. Despite everything, I continually have to find new ideas to promote PlantCatching and make it known to new gardeners. I found a new way and, you will see it, this is plain logic. SO far, many web site owners kindly wrote about PlantCatching, usually on their blog. Some did it in forums. Others added a link inside a resource page. All these mentions are useful but it makes this information very volatile and made unreachable because of new articles and content posted on top of it. Let me introduce the new PlantCatching Widget. A widget, for those you don't know, is a little box often found in the left or right column of a web site, beside the main content. It's always visible et shows dynamically some informations coming from the service provider web site. You are used to weather and social networks widgets like those from twitter and facebook. TIme for PlantCatching to do the same by displaying plant donations, requests, events and Incredible Edible containers from a given city. The data is synthetized since the widget must stay simple and should not supplant the main PlantCatching web site. That's why clicking on an item will redirect you to plantcatching.com to read more. Today, I am publishing version 1 which only displays plant donations. I will add all other data as soon as I can find time for developing it further. 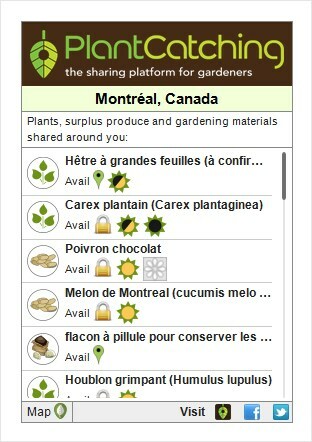 If you are a web site owner, mainly talking about gardening and urban agriculture in a particular geographical area (but I won't limit you to these domains since everyone is welcome), I invite you to install this widget so that your readers can know about PlantCatching from the homepage and see at a glanceothe offered and requested plants in their area. Don't be afraid if the widget displays only a message telling that there is nothing offered right now. 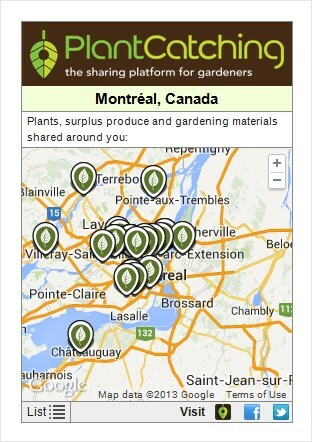 One has to start somewhere and it's time to invite gardeners to participate. Le potager urbain Michel and Josée, the makers of the now famous vegetable garden in front of their house and authors of the guide du potager urbain (I wrote a chapter), are happy to help PlantCatching in Drummondville and beyond. Jasmine Kabuya Racine, horticulturist, has a very nice blog where she talks about her passion. She links the widget to Montreal to show a maximum of results. Isabel Perin has created Echos Jardins, an association based on shared gardens. She offers plants on PlantCatching and shows it in the widget that was empty without that, in the Montélimar area. She added the map option, a good way to grasp where the action is. This widget could make a real difference. Please, install it to help the good cause (you will need an account) and let me know on what site. I truly thank you in adavance.